This one has certainly been a long time coming. Indeed, when THQ went out of business in 2012, only a few short months after the release of Darksiders II, I was almost certain that we would never see the end to the story of the Four Horsemen of the Apocalypse. Thankfully, after Nordic Games (eventually rebranded as THQ Nordic) acquired the Darksiders IP, and Gunfire Games was born from a bunch of the ex-Darksiders team, things began to look up. Now here we are, six years later, and the day I never thought would come is here: Darksiders III has arrived. For ages, the story goes, Heaven and Hell battled one another as was their wont, but in time The Charred Council was created to broker a truce between the two warring factions, and the Four Horsemen were created to ensure that balance was kept. In amongst all this, humanity was born and the Council decided that humans would have their own kingdom, and also created the Seven Seals, which were only to be broken when mankind was ready for the great Endwar. Problem is, the apocalypse started early and War was accused of causing it, which is where the first Darksiders began. Darksiders III however, begins with War in chains before the Charred Council, before he convinced them to send him to Earth to prove his innocence. This story however, much like Death’s in the first sequel, is not about War. Fury is the star of the show here, with her barbed whip and even more barbed wit, and while she struggles to believe War’s guilt, she nevertheless follows the Council’s order to find and capture the Seven Deadly Sins that have been unleashed and are now running riot on a ruined Earth. You will see an Earth ever so slightly less ruined than it was during War’s story, as Fury sees it during the period between War’s incarceration and eventual return with Mark Hamill’s Watcher. Much like their tale, Fury is also accompanied by a Watcher of her own, merely to oversee her mission rather than to keep her on a leash like her brother. It almost feels like a reboot in this way, as this story doesn’t necessarily rely on previous knowledge of the series. The introduction gives you enough information about the backstory that you can get on with things and just enjoy your time with Fury. 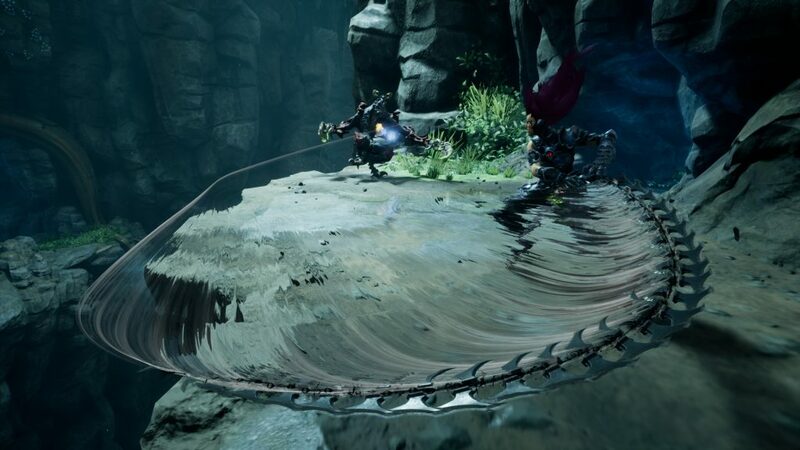 That said, Darksiders III also feels like the game to push the story even closer to its conclusion than ever before, so fans will get that extra kick out of seeing things moving forward. It feels strange then, that in order to move forward, Gunfire Games took a step backwards in order to tell a kind of prequel story. Perhaps this was done in order to make it more accessible to a wider audience, or perhaps it was something to do with the radical change in character, who knows? War and Death were exceptional characters, but they weren’t exactly fun loving. The stories in general were quite serious, both in tone and content, but Fury changes that a little. The story is still dark and serious, but Fury is a little more sarcastic in her dealings with the demons and angels that ravage the Earth. I wasn’t so sure of this in the beginning, but I found myself drawn to Fury’s mocking tone and quick temper, always quick to start fights without regard for the consequences. What about those fights, then? Well, first we have to acknowledge that Darksiders does something that very few series ever do: it changes with every sequel. The original game was essentially a Zelda game but with a much more adult theme, whereas Death’s sequel was closer to a Diablo-like loot-gathering adventure. Fury’s game, as is the “in thing” these days, is a Souls game. 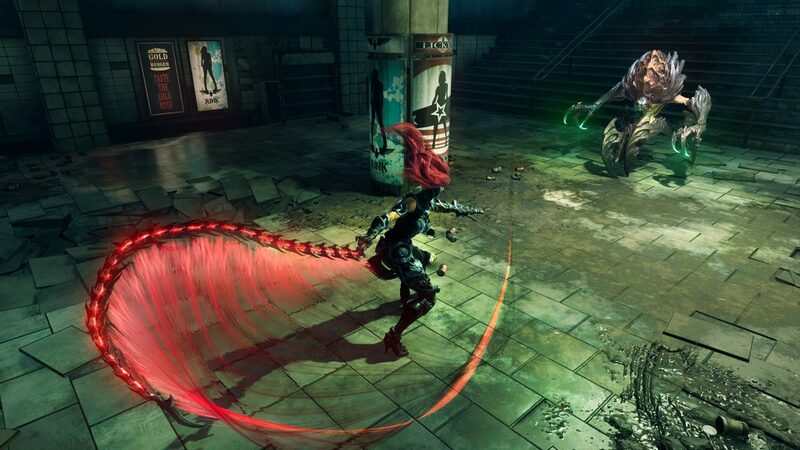 Yes, I know you’re rolling your eyes right now, but there are a few key differences here, and the very first difference is major: Darksiders III has difficulty settings. Now, I played through on the normal (balanced) setting, which offered just enough challenge to keep me from cruising through the game, but not enough to have me tearing my hair out in frustration. Sure, I died a few times during the sixteen hours of that first playthrough, but a good three quarters of those deaths were during boss fights. The other differences between Darksiders III and the Dark Souls games are a little less obvious. You have a big, interconnected world that you can traverse without loading screens (aside from one or two areas) and there are shortcuts to unlock along the way, but somewhat frustratingly, if you save mid-area, you won’t reload in that same spot. You’ll appear at the last checkpoint, which here comes in the form of Vulgrim locations. Vulgrim is essentially the demon form of the merchant from Resident Evil 4, except with an actual reason why he can appear in the middle of nowhere. Also, finding a new Vulgrim location won’t replenish the lost Nephilim health items that you have used along the way, unlike Dark Souls’ replenishing Estus at bonfires. Perhaps this is because you can’t “rest” at Vulgrim spots, but it can be quite harsh when you have to go into a boss fight without full health options. Boss fights have always been impressive in Darksiders, but they are perhaps at their most impressive in this third game. Every one of them presents its own unique challenges and, much like Souls, its own movesets and patterns that you will have to learn in order to best each foe. I loved the exploration and general gameplay, but whenever I faced a boss I was relishing each encounter. This is largely because of the excellent combat system that Gunfire Games has put in place. You start the game with Fury’s whip, which comes with its own set of moves based on combinations of quick and long presses of the attack button, pauses, and even different moves when combined with jumps and dodges. This might seem fairly standard, but as you progress through the game you’re rewarded with Hollows (four of them, eventually) that represent different magical properties that suit Fury’s mage abilities. These add even more moves to her repertoire, which can be used in conjunction with her whip attacks to create some impressive and devastating combos. You can even switch Hollows on-the-fly, meaning that you can essentially create your own “super combos” that span multiple elements. Choosing your element usage carefully is key too, as the ice element can cause extra damage to a flame-veined demon, for example. Or you can use the hammer of the Force Hollow to knock enemies backwards and even over death drops. Each Hollow has its own unique evasion counter, as dodging an attack at the last moment causes a slight time dilation effect, and pressing either the standard or Hollow attack button will result in a more powerful counter attack. Choosing which to use can be crucial, especially if you have an enhancement equipped to a certain weapon. In general, like Dark Souls 3 and Bloodborne in particular, dodging is probably your best strategy in Darksiders III. Learn dodge timing and you can do very well against all enemies, not just the bosses. Standard enemies come in many forms, as they always have, but they are far deadlier here than ever before in the series. Regular demons should be respected even when you return to an earlier area, as they can deal great damage and if they gang up on you as they often try to do, you’ll be minced into tiny Nephilim pieces. Thankfully, there is an optional danger indicator that can aid you in this regard, and it’s well worth your time using it. It’s not all about fighting, though. 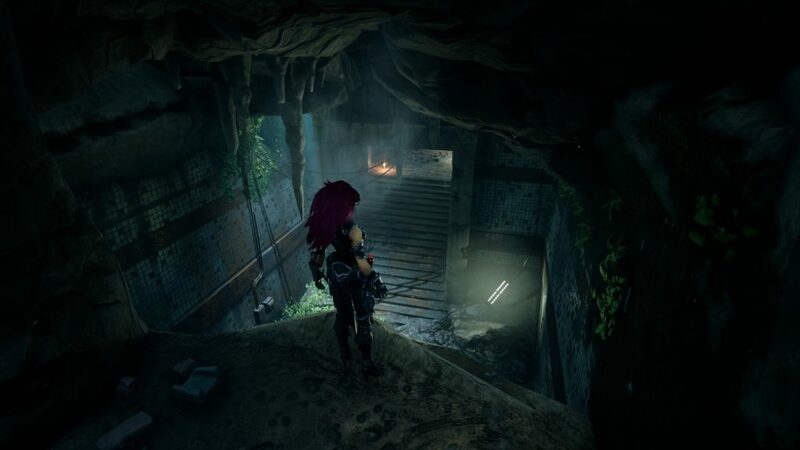 This series has always been about exploration and the puzzle-like nature of its dungeons, and Darksiders III is no exception. Instead of dungeons, each area has its own challenges that often relate to the last Hollow obtained, but some are simply a matter of being patient and taking in your surroundings. You will be taught new mechanics through the simple act of interacting with new things that you come across, and as with all well-designed games, these interactions become second nature when they become important. Even the enemy placement is often key to hinting at your next destination, although you do have a compass (of sorts) at the top of the screen that nudges you toward the next of the Seven Sins that you’re tracking. Just don’t rely wholesale on it, as it’s only there to guide you, not flat out tell you where to go. That would take all the fun out of exploring the world. What a wonderfully colourful and interesting world it is, too. 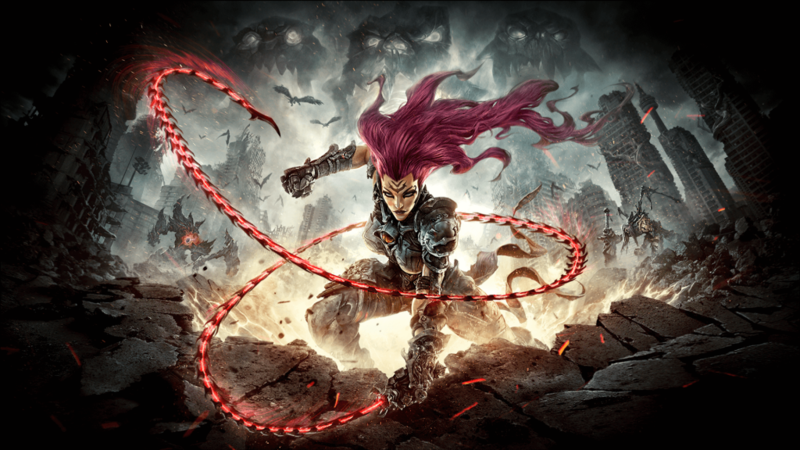 When Joe Madureira left to work on his own Battle Chasers game, I and many others worried that Darksiders III would suffer in its looks, as a result. Those worries were unfounded as it turns out, as Gunfire Games has proven, much like Vigil Games did prior, that the apocalypse needn’t be drab and brown. Indeed, even the most potentially mundane areas are filled with colour. Shattered freeways (motorways, to us UK folk) are surrounded by colourful seas of poison, or underground train stations are littered with bright blue eggs and shafts of brilliant light that pour in from holes above. The game ran nicely throughout my sixteen hour playthrough, with only one issue around halfway through when the game paused for around twenty seconds to load the next area. Except it didn’t fully load it, but a quick exit and reload fixed that and I carried on without that happening again. Its framerate stayed in the 50-60fps range throughout gameplay at 1080p on my PC, only ever dropping below that during the locked 30fps cutscenes, which tell Fury’s story wonderfully. It’s worth noting others on the team have been playing on PS4 (standard and Pro) and the performance certainly doesn’t match the PC version: there are streaming issue which cause load freezes and the frame rate isn’t even close to the version I reviewed. I’ll be having a look at the Xbox One X version soon, too. After six years of waiting, not counting the remaster releases, Gunfire Games was always going to have a mammoth task ahead of it, but Darksiders III is a triumph. Its world and character design are up there with the best in the series and its story, although more understated than previous entries, moves the overarching story forward more than ever before. Just don’t make us wait another six years for the next one, please. 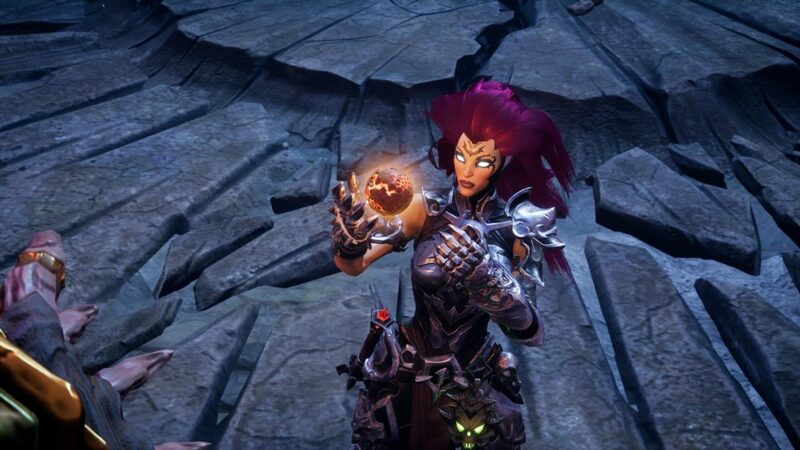 Darksiders III is a stunning achievement, bringing the once-dead series back to life with aplomb.